An 11-year-old child and a woman are among four people injured in a suspected shooting in south west London. 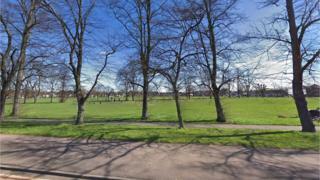 Police were called to Figges Marsh, Mitcham, at 17:40 GMT on Sunday after reports that shots had been fired. A large group of men was seen in the area before the suspected shooting and officers are trying to trace them. All four of the injured were treated for non life-threatening wounds. No arrests have been made. The Metropolitan Police has activated a Section 60 order in the borough of Merton which allows officers to detain anyone for searches. It will remain in place until 06:55 on Monday. A force statement said: “A woman and an 11-year-old child were treated by the London Ambulance Service for injuries believed to have been caused by a firearm. They have been taken to hospital. “A large group of males had been seen in the road prior to the firearm being discharged and inquiries are ongoing to locate these individuals. “It is believed that two further people – who subsequently self-presented at a nearby hospital – were injured during the incident.